The Yum! 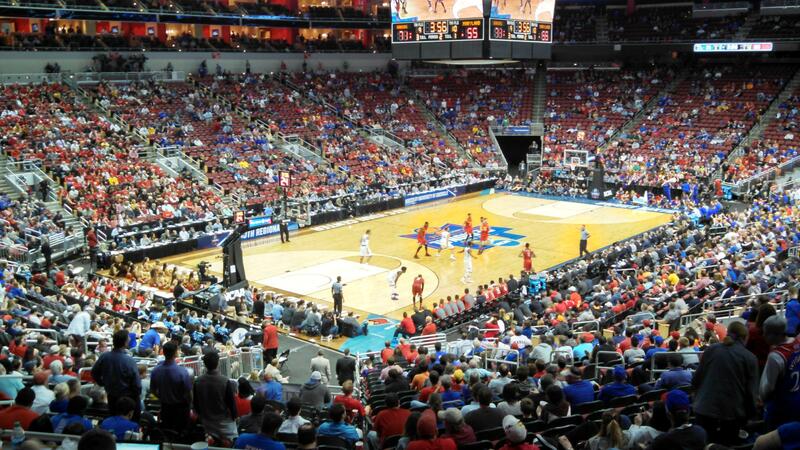 Center in Louisville, Kentucky is hosting the NCAA Basketball Southern Regional this year. Next year, Kansas City will host the Midwest Regional. In the NCAA tournament, the Kansas Jayhawks play Villanova Saturday night with a berth to the Final Four on the line. The game will take place in Louisville, a city that considers itself the center of the college basketball world. Something that fans in Kansas City might dispute. “I think when you add up all the history, I think that you could make a case that the Kansas City area is probably about as knowledgeable and historic a place that our game has seen,” says KU coach Bill Self. If Bill Self weren’t coaching the top-seeded Jayhawks, he would make a great ambassador for Kansas City and the surrounding region as the nation’s college basketball mecca. Self points to the College Basketball Experience, the NAIA tournaments and the number of NCAA tournament games held through the years that support the argument. But, because Louisville is the top market in the U.S. for college basketball TV ratings, and has been for the last 13 years or so, Louisville is painting itself as a college basketball hub. Funny thing is, Karl Schmitt, the president and CEO of the Louisville Sports Commission says his city doesn’t even view Kansas City as its closest competitor. “When you look at this argument of—what is the basketball mecca?—most people here look to our east. To the state of North Carolina where Duke, Chapel Hill, N.C. State foster that argument,” says Schmitt. With the Louisville Cardinals now playing in the Atlantic Coast Conference, it not only fuels those rivalries, but also the TV ratings. “As we would say around here, “L” yes!” exclaimed Tobi Hammond, an events coordinator for activities at Fourth Street Live!, similar to the Power & Light district in Kansas City and managed by the same company. Hammond spoke from the Sports and Social Club, which has more than 60 TVs. If the Louisville Cardinals or Kentucky Wildcats are not playing, Hammond says the TVs in the still show other games. Especially since Louisville sits across the Ohio River from Indiana. The game between Kentucky and Indiana drew the highest rating for the NCAA tournament and the overall college basketball season. But that doesn’t stop Louisville from welcoming Kansas fans this weekend, especially since the other three teams that advanced in the South regional—Miami, Villanova and Maryland—didn’t come close to bringing the number of traveling fans as the Jayhawks. David Wheatley, who lives in Columbus, Ohio, considers himself and his two buddies as the only Jayhawk fans in heart of Ohio State country. The city of Louisville is thankful for the KU fans because all the teams the local fans pulled for to make it to Louisville are playing elsewhere. Kentucky lost last weekend, but would have gone to the East Regional in Philadelphia had the Wildcats won. The two Indiana teams alive before Friday night, the Hoosiers and Notre Dame, played in Philadelphia. What that means for Jayhawk fans is a friendly reception in Louisville and lower ticket prices on the secondary market. Next year Kansas City will be a regional final site. Louisville fans might have a chance then to learn more about Kansas City. Greg Echlin is a freelance sports reporter. The NCAA soon will crown a new college basketball champion, but they're also looking back 50 years at a championship game that made history. Senior forward Jerry Armstrong grew up in rural Eagleville, Missouri. He played throughout the season and in the tournament, but he sat out that game. Why? He's white. 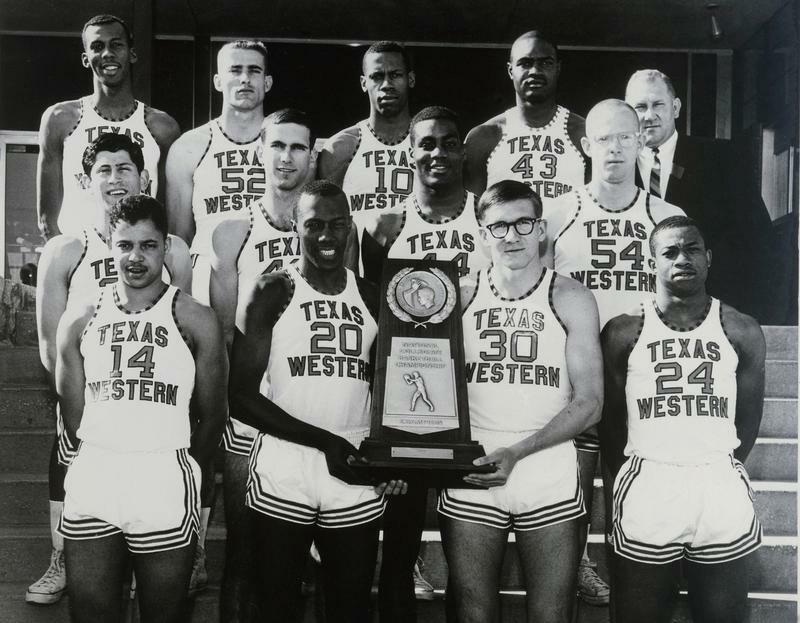 Texas Western only played African-American players to beat an all-white Kentucky team and win the championship. David Lattin, one of the African-American starters in the title game, there's a misconception about the 1966 Texas Western roster.